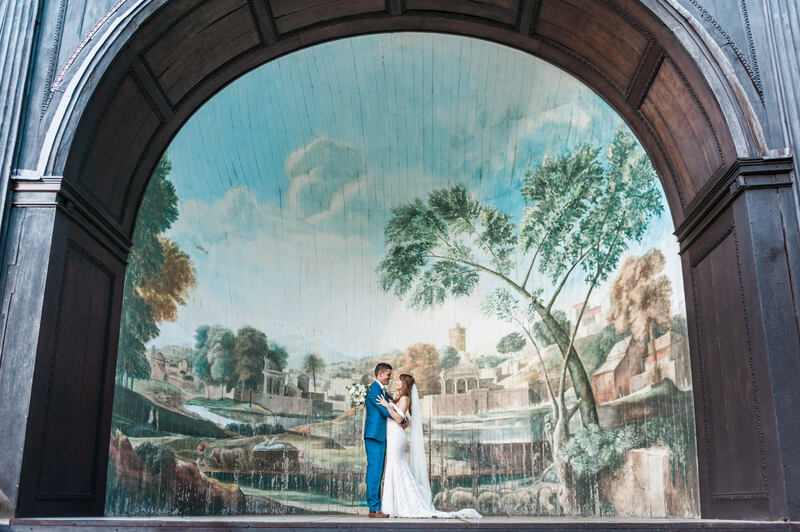 As a wedding photographer who used to work in musical theatre in a former life (I used to work as a singer/actrice, musical theater dramaturg and even was a musical theatre producer) I have a soft spot for weddings that take place in a theater and weddings that are theater themed. 1. 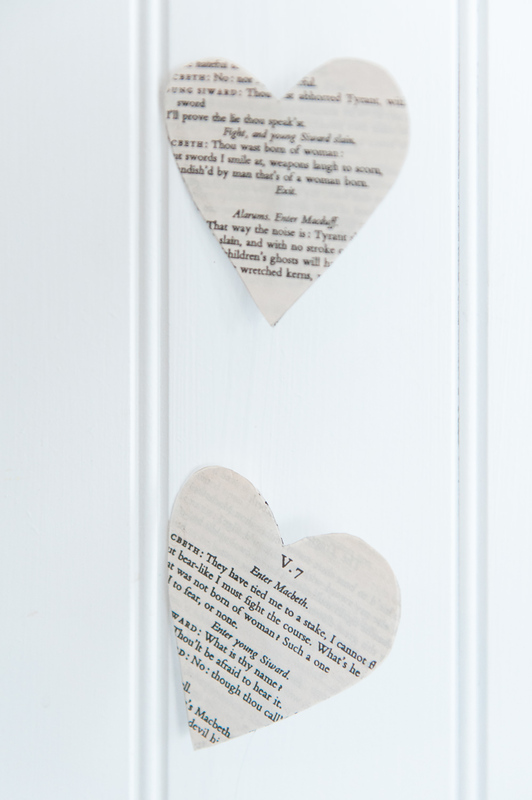 Make bunting or for example heart shaped decoration out of the script of your favourite play. 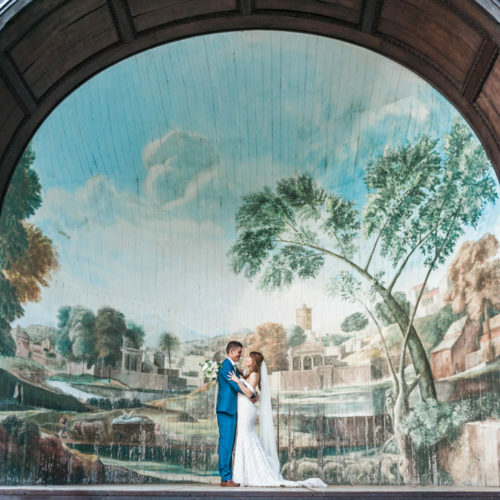 Josephine and Paul did this for their wedding in Cornwall. One of Jo’s favourite plays is Shakespeare’s Macbeth and she used the pages of paperback pockets to make heart shaped garlands. Alternatively, you could write your favourite (theater) quotes on heart shapes on strings. Heleen and Siemen made these to decorate their ceremony. 2. Use a table runner or backdrop with a theatre text. 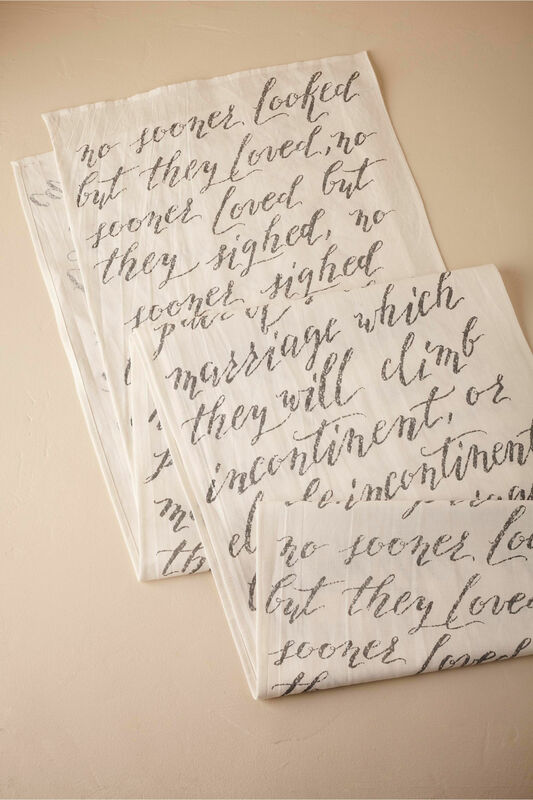 BHLDN is selling a table runner with a text from Shakespeare’s “As you like it” written on it in calligraphy. But if your favourite text is something else you can of course also hire a calligrapher to make one for you or you could make it yourself. Alternatively use the ribbons of the bridesmaids bouquet to quote your favourite theatre texts. Or even better choose a text from one of your favourite plays or musicals that describes how much or why you love the particular bridesmaid carrying that bouquet. 3. 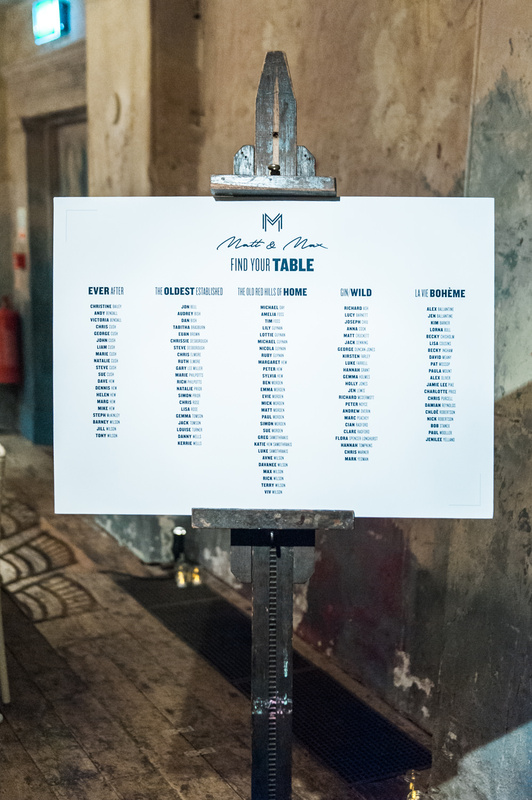 Name your tables after your favorite plays, composers or theatre characters. 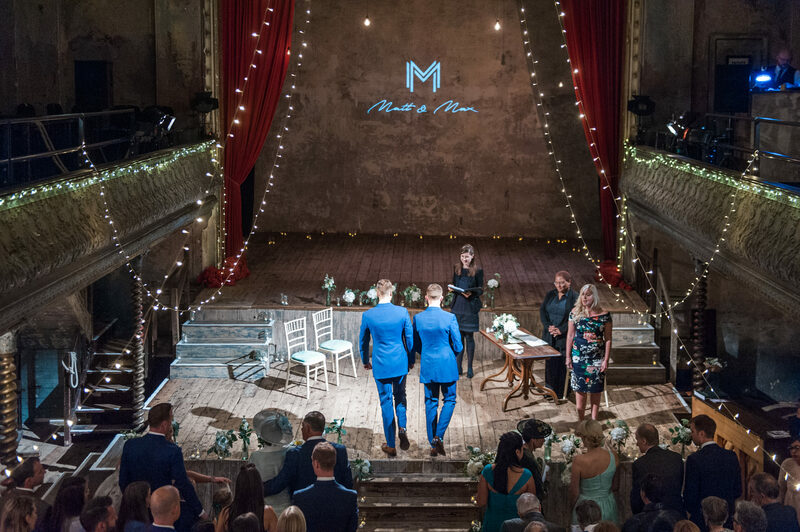 Matt and Max used the musical theatre plays they starred in together as inspiration to name their tables on their seating plan. For example “Ever after” hints to Stephen Sondheim’s Into the Woods and “La vie boheme” refers to the musical Rent. 4. Create a program that works like (or is even designed as) a theatre program. 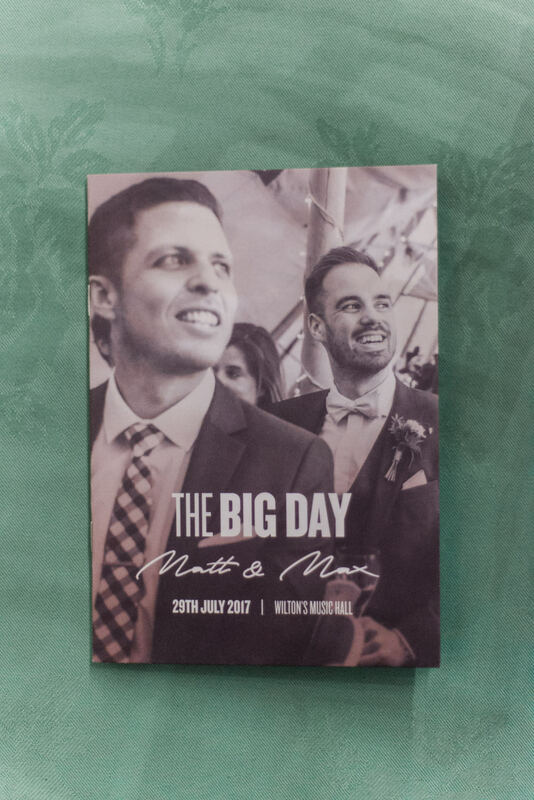 It’s the perfect way to inform your guests of the time line as well as give credits and thanks to family and friends who helped out with organising the wedding or just the people in your wedding party. 5. 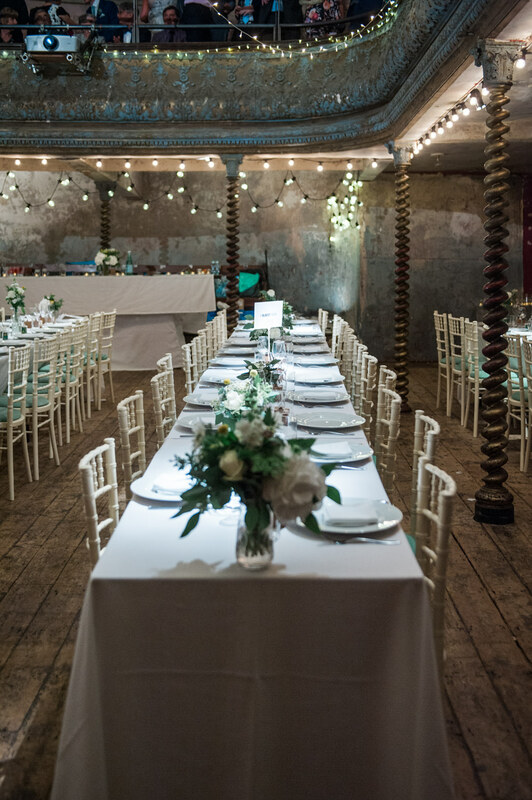 Choose a theatre as your wedding venue. I mean, you don’t really need anything else if you start by choosing a wonderful and theater theme appropriate venue to begin with. So, if you want to go with a theater themed wedding choosing a theatre to get married in just makes sense. Alternatively you could consider a circus- or spiegeltent (these are primarily found in the Netherlands and Belgium, there is a photo of a spiegeltent at the bottom of this post). 6. Choose readings or music (if you love music(al) theater or opera like I do) from your favourite works. If you’re looking for wedding appropriate musical theatre songs you might want to look at this playlist. People use music during ceremonies particularly during the walk down the aisle but also during the signing of the registry or to walk out of the ceremony as a married couple. If you are after a reading you simply choose a text that you love and feel like is an appropriate reading about vows or your love for your partner in particular. 7. 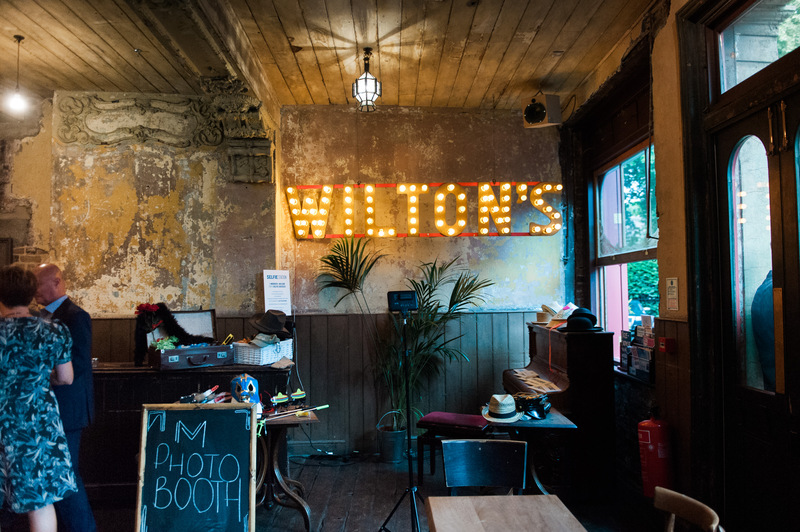 If you work in theatre or do community theatre you’ll probably know where to hire or borrow props, these could be awesome to follow through on your theater theme in a photo booth. If you’re looking to buy or make stuff yourself you could think of stuff like venetian masks, theatre binoculars, a phantom of the opera mask, a cyrano the bergerac nose, a tutu, a red clowns nose, a top hat, a lorgnet or ocular, a hand fan or a recognisable prop from your favorite play. 8. If you’re bold you could give your guests a dresscode to come as their favorite theatre character. Not all families will react positively on this so make sure you’re inviting the sort of crowd that’s comfortable with this (or who are willing to adapt to your wishes on your special day). If you know your guest list consists of lots of musical theater lovers you could also include some late night musical theatre karaoke either on the stage or in a seperate room (if you’re not too convinced by their singing abilities 🙈). 9. A theatre themed wedding cake. This speaks for itself I guess. The cake could have your favorite theater text about love on it. 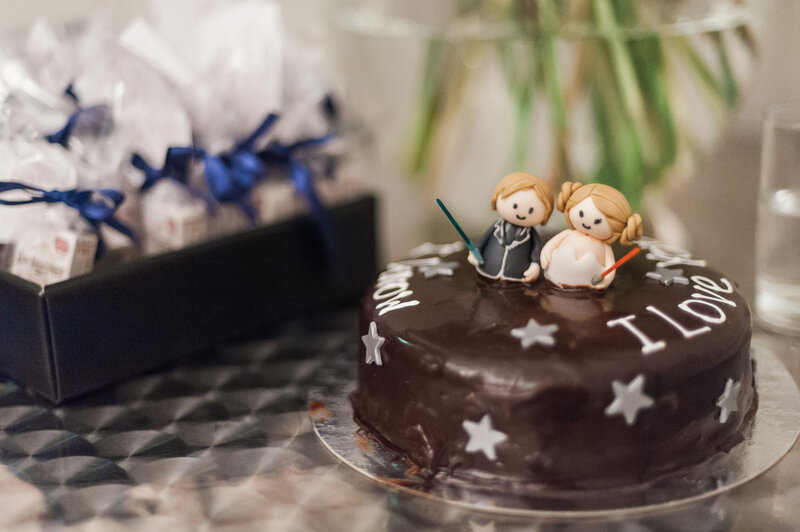 For example I once shot a wedding in which they had a flying Star Wars cake. The caketopper was a prinses Leia and Han Solo and a fondant text read: ‘I love you’, ‘I know’. I’m sure there are loads of texts in plays that could be adapted to a cake in the same way. 10. Choose a celebrant that can handle the theatrical. You could opt to hire a comedian or actor who is ordained but you could also go with a celebrant who knows how to work a crowd in the way you prefer. Some celebrants are great at delivering heart felt ceremonies but aren’t funny at all. While others are funny but don’t know how to properly mention a loved one that couldn’t attend or passed away. 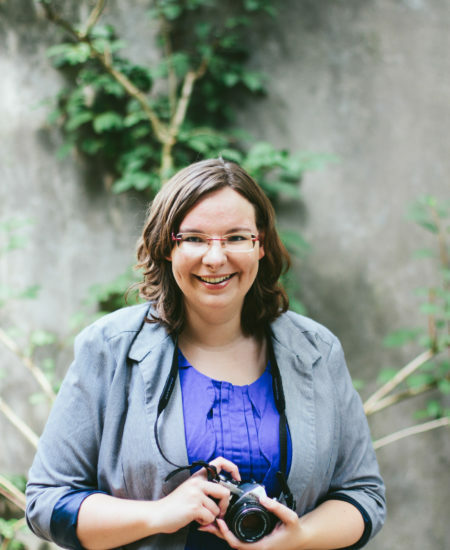 If you think about what’s most important to you, you’ll know what to look for in a celebrant. 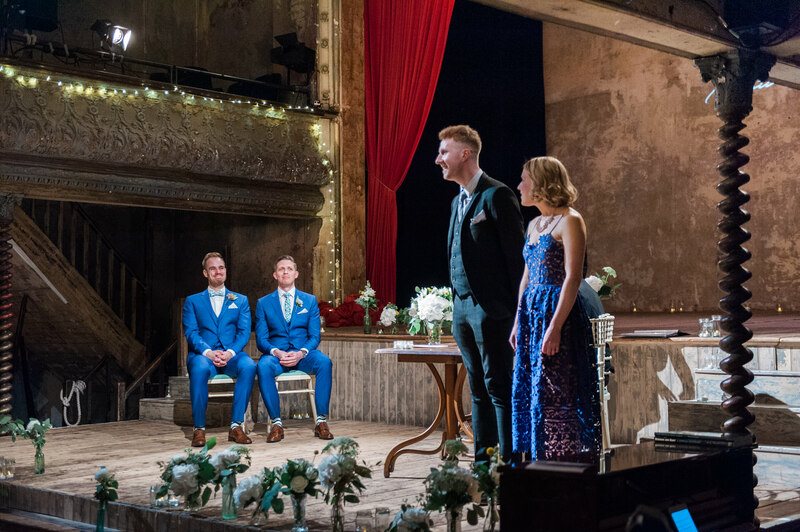 Chances are that if you’re going with a theatre themed wedding the celebrant will be on a stage and they will feel even more exposed than usual. Plus they need to know how to work with a microphone or, if there isn’t any amplification, how to carry their voice in order to be heard by all your guests. Speaking in public is a craft and not all celebrants seem to be aware of that. 11. Book an engagement photo session (aka love shoot or couple shoot) and go to your favourite theatre to shoot the photos. I did this myself a couple of years ago and we included some photos in front of my favourite theatre, The Menier Chocolate Factory in London. 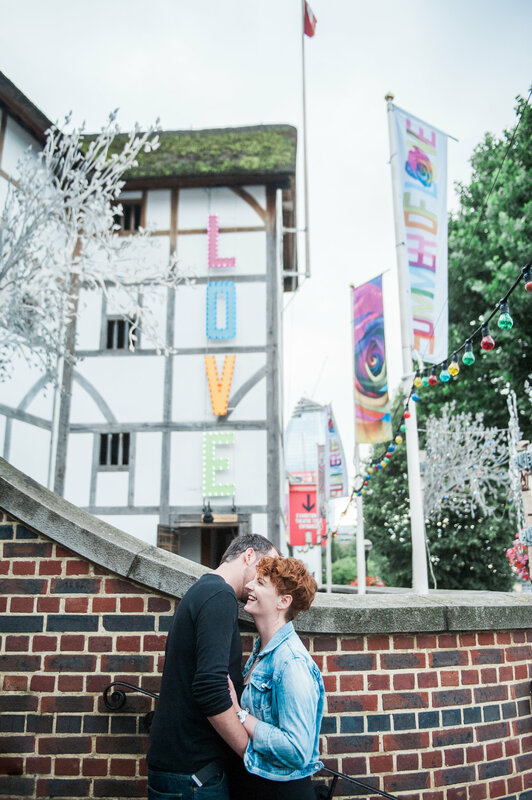 This summer I’ve also shot Siobhan and Joe in front of Shakespeare’s The Globe which is Siobhan’s favourite and coincidentally is situated in the same London borough as The Menier, namely Southwark. 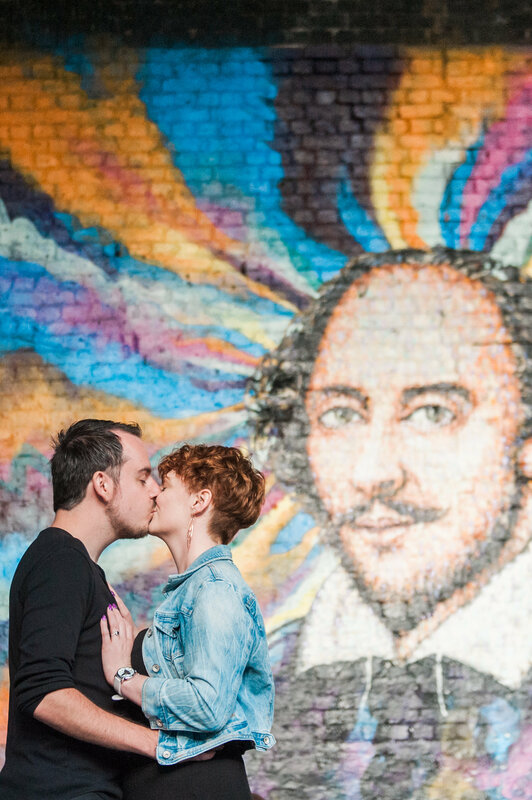 And we did a couple of shots in front of a close-by mural of Shakespeare which Siobhan loves. If you can convince your favourite theatre to let you go inside then that’s also possible. I’m also a theatre photographer (as a former dramaturg turned photographer, I still love working in the theater), so I know how to shoot in theatre lighting, I’ve even shot a portrait session in the auditorium of a theatre. I can work with any theatre related environment really. I hope these ideas on how to create a theater themed wedding were helpful. 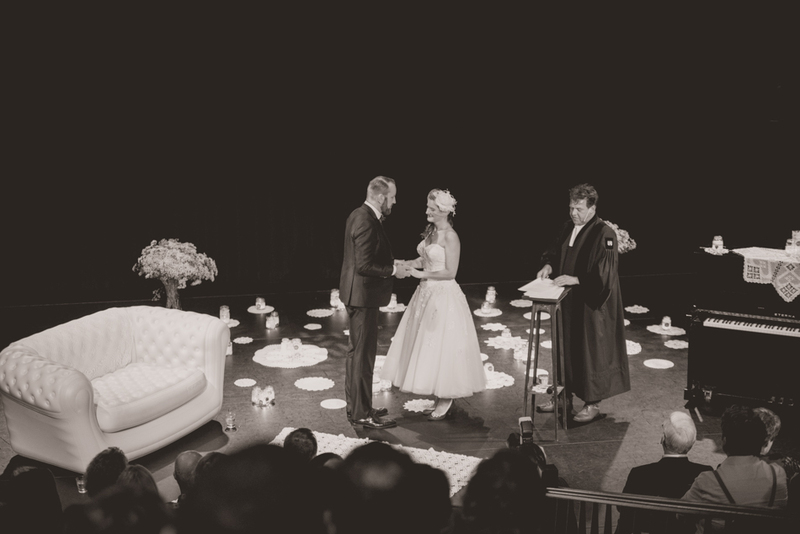 Are you interested in hiring me as your wedding photographer for your theatre themed wedding? I’m available for weddings throughout Europe. Contact me so we can chat about all your plans, my rates and to get to know each other a bit. Have a look at my wedding portfolio to see more wedding photos, read the about me page to learn about who this ‘I’-person is.